April 2012 Archives - Newman Dignan & Sheerar, Inc. - Providence Fee-Based Financial Advisors April 2012 Archives - Newman Dignan & Sheerar, Inc.
Markets finished decently higher last week on news of another blow-out quarter from Apple. Other excellent earnings reports came from Amazon, SunTrust, Boeing, AT&T and others. 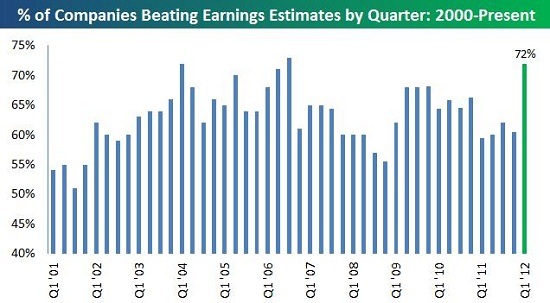 S&P 500 companies are continuing to report strong earnings as approximately 72% of the companies reporting have beaten estimates. Comments from Fed Chairman Ben Bernanke were well received as the Fed continued to support the markets with their comments and hints of further stimulus (if needed). Economic news for the week was mixed as durable goods orders and 1st quarter GDP growth were less-than-stellar while housing data were better-than-expected. Europe continues to be a wildcard as Spain suffered an expected ratings downgrade from Standard & Poor’s (downgraded two notches to BBB+ from A). GDP reports from the UK pointed to an official recession – again, no surprise. A plethora of earnings reports due out this week along with key manufacturing reports will likely set the tone for the week ahead. We suspect that earnings will continue to be strong while manufacturing reports could point to a temporary slowdown in US and worldwide activity. China’s PMI manufacturing report, due out Monday evening, could add to market volatility. What, me worry? Last week was a bit more of a bumpy ride in the equity markets than we’ve grown accustomed to for the last several months. Intra week price swings oscillated between concerns over Europe (selloffs) and better-than-expected corporate earnings (rallies). At the end of the week, the tug-of-war was mostly in favor of US stocks. The major indices like the Dow Jones Industrial Average and the S&P 500 posted gains while the tech heavy Nasdaq slightly declined (mostly attributable to Apple). 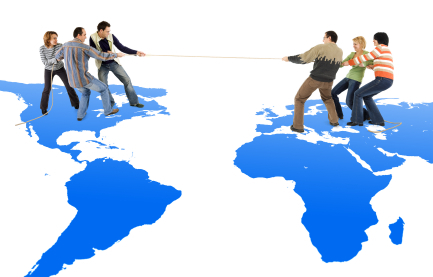 Will earnings hold the tug-of-war match this week or will Europe make it on the board? Last week’s economic data was a mixed bag which is no surprise to ND&S as we believe we are in an economic environment of fits and starts. Retail sales were healthy last week with a gain of 0.8% which should positively impact this Friday’s GDP report. Manufacturing data from New York and the Philly Fed indicated growth but less so than March. And housing continues its long bottoming process with existing home sales softening to a 4.48 million unit pace down from 4.6 million in February. This week we’ll see home price updates from Case-Shiller and FHFA which combined will most likely be negative but less so. Friday will cap the week with 1st quarter GDP which is expected to come in at + 2.5%. Weekly Commentary: A correction, finally! Only two short weeks ago the markets were relatively calm. First quarter stock markets posted strong returns and the typical pundits were back on the TV calling for sky high returns for the months and years ahead. The latest peak occurred near the end of the first quarter, and the next emotional extreme will be at the interim low. This chart pretty much sums it up. We, at ND&S, still see value in equities today but we would not be surprised to see stock market weakness continue for a bit longer. Below is a chart of the S&P 500 over the past 6 months. The markets have moved strongly off their lows from last fall so a correction will help cleanse the system of excessive optimism. The headlines are back to warnings of the European debt crisis such as rising Spanish bond yields or the increasing probability of a hard landing in China. Until data say otherwise, we’ll call it a correction. We are not market timers and do not believe in following the herd. 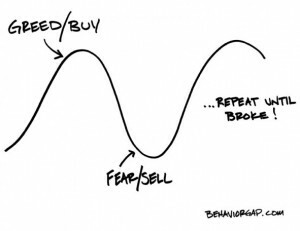 We believe that a sound investment plan is necessary to keep investors on track and not fall victim to the classic mistake of buying high and selling low. Weekly Commentary: Sound Money Anyone? With good first quarter gains behind it, the market is now assessing the outlook for the rest of the year. This is producing some near-term trepidation. Friday’s less-than-expected employment gains [120k actual, 200k estimated] capped a week of disconcerting news: ISM Services [56.0 actual, 56.7 estimated], Spanish debt yields [higher than hoped] and the release of the latest FOMC minutes. The FOMC March policy meeting minutes talked about forward policy guidance being conditional on economic developments. This implies that dates for policy change [when will the excess money printing end?] are subject to revision. Revisions might be in response to faster than expected GDP growth, higher than expected inflation or perhaps exchange-rate market/bond market rebellion. The Fed is often considered to be the market’s Rosetta Stone, and Tuesday was no exception. The markets responded immediately by trading the dollar higher [fewer dollars in circulation], dropping commodities [they are priced in dollars] and strengthening treasuries [lower risk of inflation]. Some market observers argued that the Fed’s mindset should not have been a surprise, since the Fed is always updating its forecasts and policy based on the best [and most recent] data. There are also some who argue that the effectiveness of additional easy money [at least for this economic cycle] is minimal. It is obvious that the end to limitless easy money was not built into quarter-end prices, and that the transition to sound money is/will be challenging. Stay tuned. The U.S. stock market ended the first quarter of 2012 with its strongest start since 1998*. The DJIA was up 8.1% and the S&P 500 was up 12%. Investors’ concerns eased as European debt issues have been pushed back, at least temporarily, with Greece’s successful debt restructuring. Also the U.S. jobs picture has been gradually improving with new jobs being created at over 200,000 jobs per month for several months (see chart). Look for more of the same this Friday as estimates call for 210,000 new jobs created in March. Although the unemployment rate has been holding steady above 8% that is more a function of additional people coming back into the workforce as the economy continues to gradually improve. April is the start of the earnings reporting season for the first quarter of 2012. Look for a substantial slowdown in the rate of earnings growth reported by S&P 500 companies. Current estimates are for only a 0.9% earnings go ahead. Analysts look for earnings growth to pick up as the year goes along but comparisons will be tough as operating margins are already at or near historic highs. Last night Kentucky won the NCAA Men’s Basketball Championship which they last accomplished in 1998.